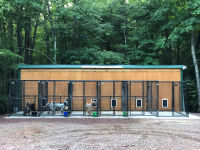 Our kennel was built in the summer of 2018. We built a 32 foot long building just for our dogs. Each kennel goes into the building and a raised bed is provided there for their comfort. The building will be heated in the winter and cooled in the summer. ​No doubt the dogs will love this during the winter when the weather is bad. We put up a long kennel run so our dogs can play and be safe. Our puppy house was also built the summer of 2018. This is just for the puppies when they reach the age of no longer being in the house. There is also a puppy kennel for them to go outside and play when the weather is nice. This has a raised floor system specialized for puppies. Everything falls through so they are never stepping or rolling in their feces. The same systems are also inside as well. There is also a kennel provided for the momma dogs, so they are always with their pups. They can come in and out of the building as they want. This building is also heated and cooled to keep everyone comfortable.